The secret ingredient to a really good battered fish fry is beer. Use good beer because the taste will definitely stand out. Fry up a bunch - everyone's gonna want seconds! To make the batter, sift the flour into a bowl, or put it in a bowl and whisk it. Add 2 tablespoons of peanut oil, then gradually whisk in the beer. The batter should be thick and heavy. Beat it well to get rid of any lumps, season generously with salt and pepper, then let rest for 30 minutes or so. Heat a good amount of peanut oil (about 2-inches deep) in a large, deep, heavy-bottomed pan until it reaches 320°F (160°C). Dip your chosen piece of fish into the batter so it is thoroughly immersed, then lift it out and hold it over the bowl for a few seconds so any excess batter drops back in. Now lower the battered fish into the hot oil. Do this one piece at a time, if using large portions, or in small batches for smaller pieces, so as not to crowd the pan. Fry large pieces of fish for 4 to 5 minutes, and smaller items, for 2 minutes or so, until golden brown and crisp. Scoop them out with a wire skimmer, and transfer to a warm dish lined with paper towels. Keep them warm while you fry the remaining fish, then serve right away, with ketchup or perhaps some tartar sauce. 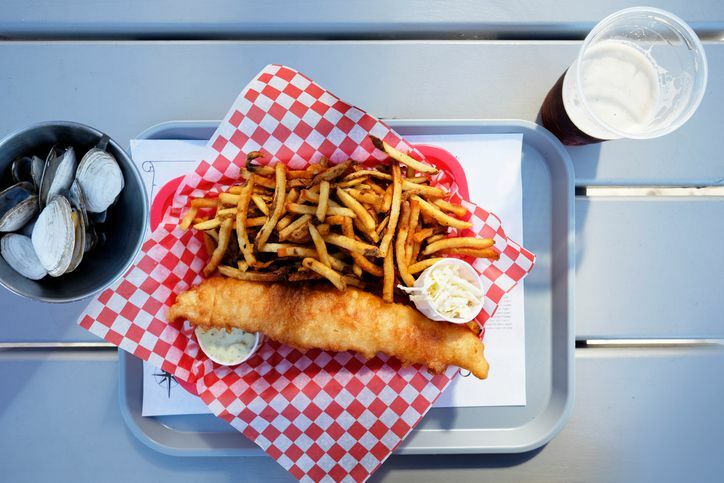 More on one of the British's favorite meals - Fish and Chips.